Not sure what exactly defines a Southern Christmas porch. But hey, I live in the South, and this is my rustic porch! I never got around to showing you the other side, because I had one last touch to add. While out with the girls yesterday I spied this big "OLD" SOUP pot. Loved it, and at $9.00 it was coming home with me. Soup? I said oh yes, poinsettia and cabbage soup..ever hear of it? I love these big ole stockings I bought several years back at the Dollar tree. Cute little ginger bread cooking cutters I scored in an antique store in Western New York for a few bucks, I knew I would find something to do with them. Love my little family pillow. And there is the rest of my Southern front porch. A little rustic, little old, a little new, little whimsy and you put it all together to create a warm Holiday Hello! Gorgeous Carolina day here today. A little brisk, but the sun is shining, and the sky is ever so blue. I love porches and yours is simply fabulous!! Wonderful! I love the red and white pot! Wonderful pot! I love finding pots and baskets that I can fill with flowers for decorations. Your porch looks lovely! So festive and adorable in every way. wow, your porch looks terrific~! I love what you did out there..
Oh I love those big gingie cookie cutters. I would have snagged those too. Your porch is very inviting and very similar I dare say to ours out here. No snow for us but still have plants and flowers. Debbie, you have the cutest porch decor! Those stockings and cookie cutters are awesome! And what a great use for the soup pot! So cute! It looks very sweet! I'd call mine a Northern porch, simply because of all the snow on it. Brrr, we recently moved to this new city and it's freeeeeezing here! Debbie, I love your rustic porch. The soup pot with the poinsettia and cabbage is great. Wish I had a porch to decorate. Such a gorgeous Carolina porch!!! Very festive. I'd say those rockers are pretty Southern.Would love to set and rock awhile. Richard from My Old Historic House. How cute! Your humongous cookie cutters are fabulous. You're so funny! I bet the lady gave you a funny look when you told her about the type of soup you were making. Ha! It's a cute addition to your porch. Your rockers look perfect outside in their red paint too. Very festive! I want to just come and sit out there with you (when it isn't freezing) and enjoy a mug of hot chocolate in one of those rockers. I love your porch and that soup pot! What a great find. Your porch is as bright and cheerful as you! Love it! Looks Southern to me, and I'm as Southern as they get! Great job!!! So lovely! Sunlight, I remember that, I think. So festive and pretty Debbie! I know how it's a southern porch....no snow! hehe. Now that's a porch where you could really sit and relax.... lovely!!! 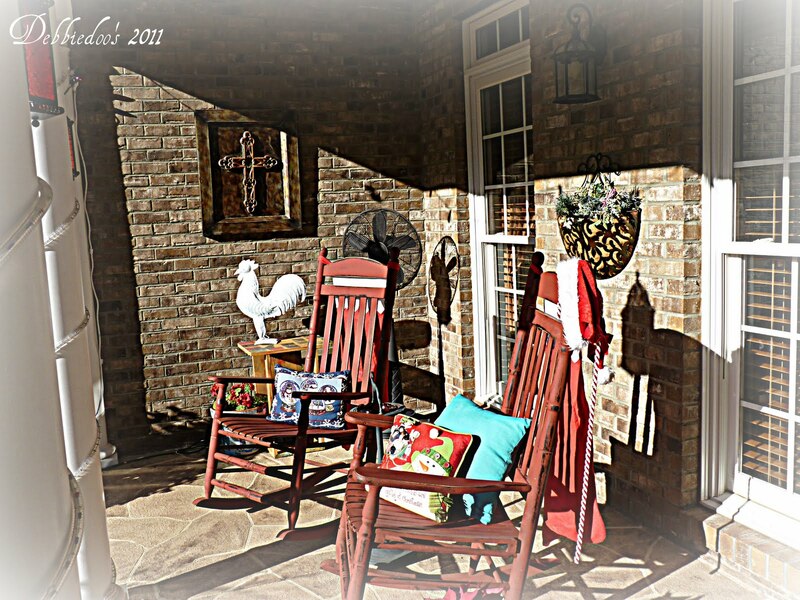 Your porch looks great, Debbie! I absolutely love the gingerbread cookie cutters...what a find! your porch looks amazing, all thats missing is snow! Hi Debbie ... love your porch and see Mr. Roo out there with his white winter coat (of paint) on. Your detail is the greatest and your pictures hold my interest. Makes we want to redo my porch. Your porch is so warm and welcoming! Love your poinsettia soup! So inviting and pretty! I just love browsing your website! your porch is amazing, Im new to your blog but I have a feeling Im gonna be a regular!!!! Love your front porch. Very inviting. I especially like the stockings. The rocker is very Southern. Just too cold here to get away with that this time of year. Love your porch and the rockers, Debbie! Even in December it looks inviting! Debbie, I love your porch all decked out for the Holidays. It must be wonderful to be a guest at your door and be greeted with all that beauty before you even get in the house! Pretty Southern Porch! Merry CHRISTmas Ya'll From Houston! I love the red and white emamelware pot, you got it for a good price! Looks especially pretty with the poinsettia in it! What a welcoming front porch. The pillows are my favorite. I try to pick a couple new ones up each year. Those cookie cutters are a riot. I love your porch. It has Debbie written all over it. I love your southern porch! The soup pot is amazing! It's perfect for Poinsettia and cabbage soup! It all looks terrific! How pretty Debbie! 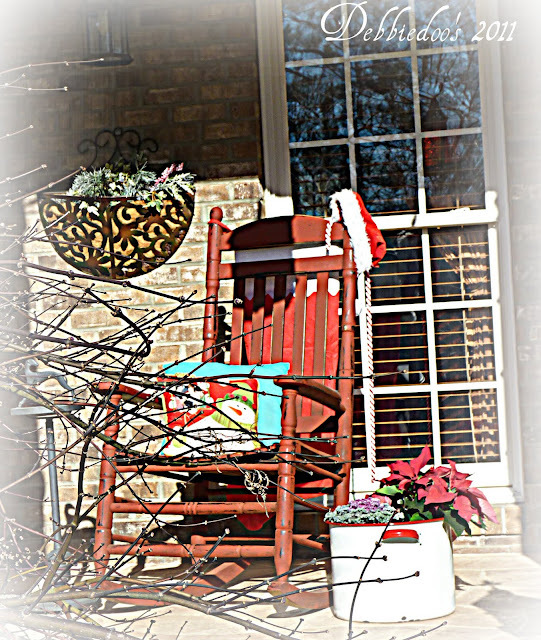 Love your Christmasy porch! Enjoy it and the Christmas season! Gorgeous Debbie!! 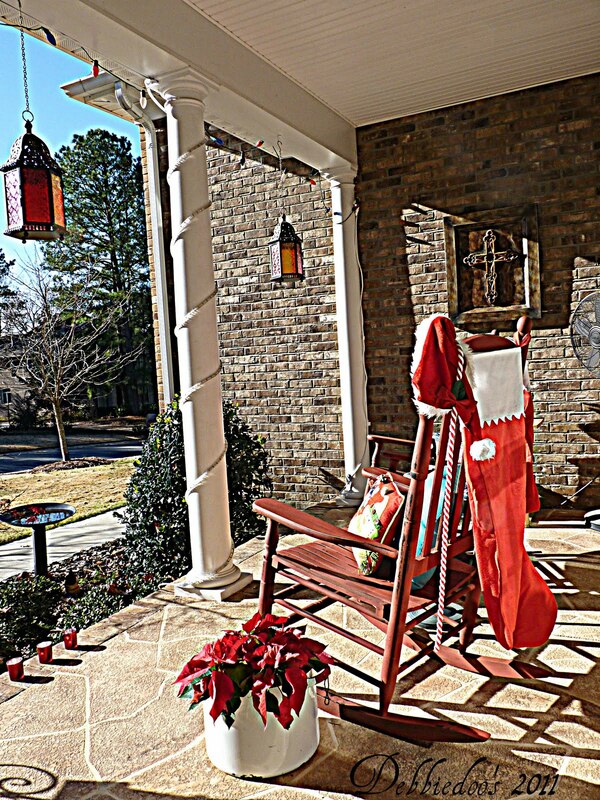 It is a wonderful front porch..so festive and inviting! Love this!! Such great finds! I love your porch! all your Christmas touches are the perfect blend to welcome friends and family. Your porch is so pretty and looks so inviting . Love the red rocking chairs! I love your porch! Those cookie cutters are adorable hung up! Love your new pot, too! Thanks for sharing. What a pretty porch and what a luxury of warmer weather to be able to put out pillows on your chairs. Your porch looks both festive and inviting. It was 29 degree's cold when I woke this morning..took most of the day for the temps to climb. It's now 44 and feeling warmer..but, the reason I bring this up is it's so cute to see the standing fan on your decorated porch...you should add some red ribbon to it..LOL! Brrr! Love the pot, I recall those back in the days. You are lucky to find one! Vintage shoe form and blogging friends! 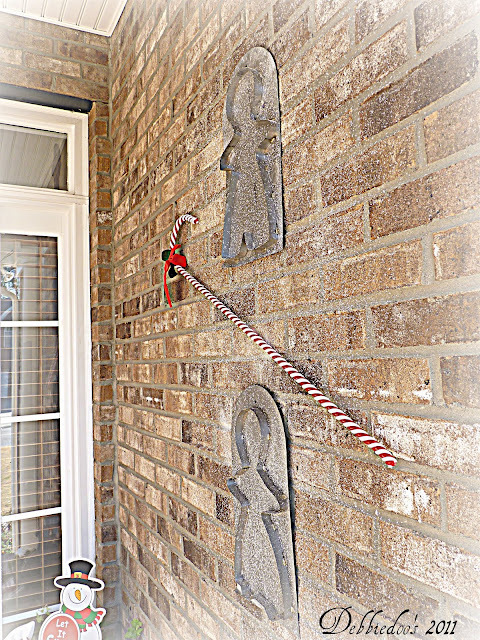 Decorating with Ice skates for the holidays!